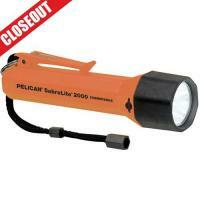 The Pelican Products 2000C Saberlite flashlight is designed with quality and performance in mind. The body is designed from ABS resin, which protects against chemicals, corrosion, high heat and extreme cold. The flashlight has a bright Xenon lamp that produces a bright white beam.